There are many different recipes for making goulash. 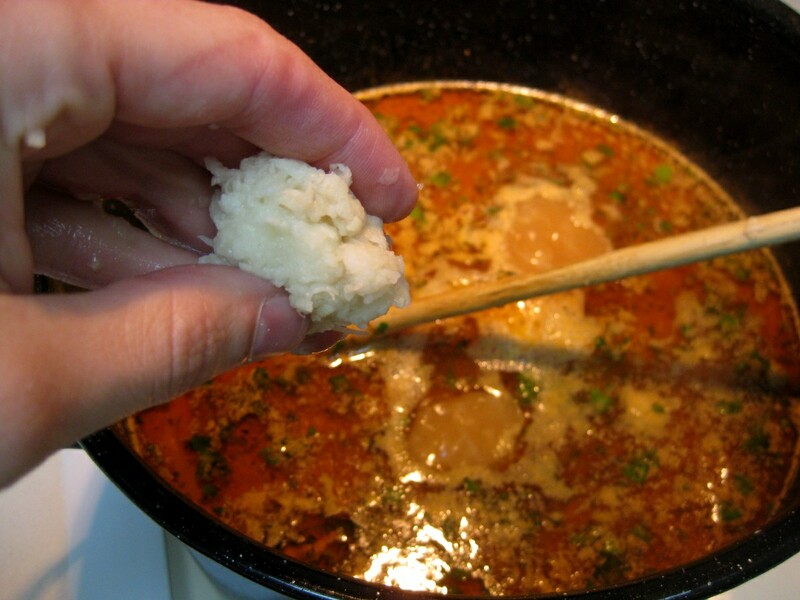 There are soups and stews, and some are simpler than others. 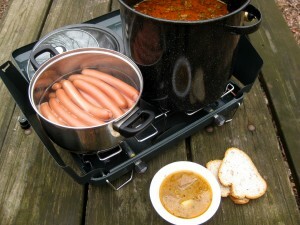 In fact, one of the first recipes on this site was for a goulash soup. 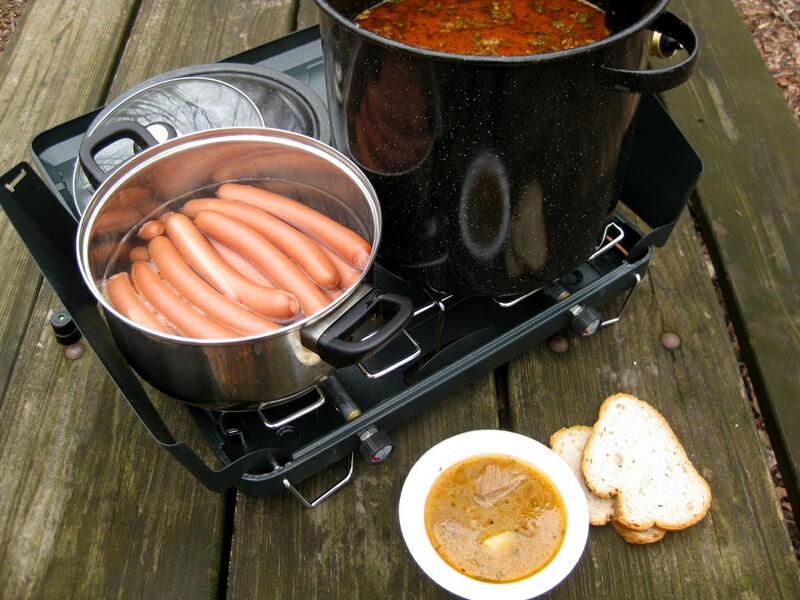 Here is a slight variation on that recipe, this is the classic kettle goulash (kotlíkový guláš) that is popular at Slovak picnics. 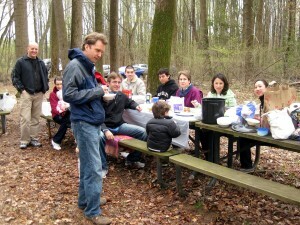 In fact, I prepared it for a Slovak picnic (and hike) organized here in the D.C. area through our Slovak Meetup group. In making this recipe, I followed video recipe from Varecha.sk. Here is what you will need for this version of goulash: beef, potatoes, onions, and various spices. Chop the onions (cibule). 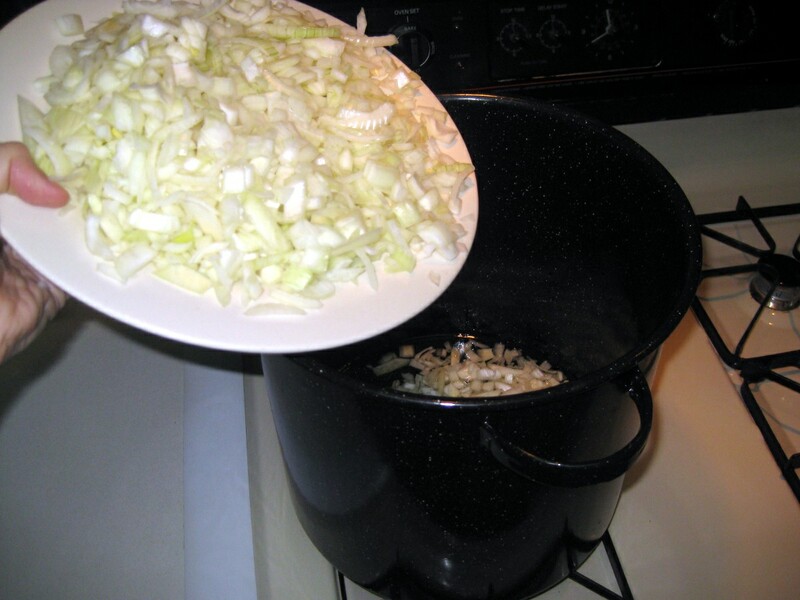 The pieces don’t have to be too small since the onions will dissolve during cooking. 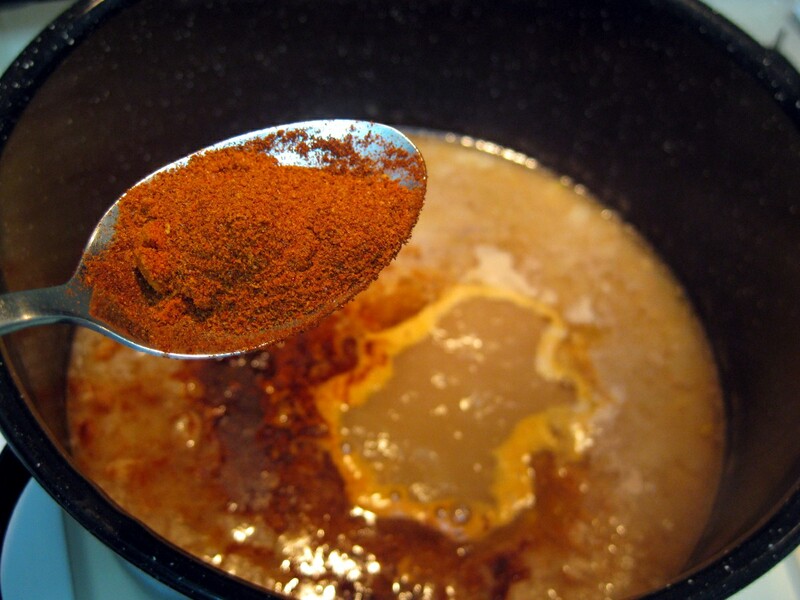 Pour the oil (olej) into your kettle and wait for it to get hot. 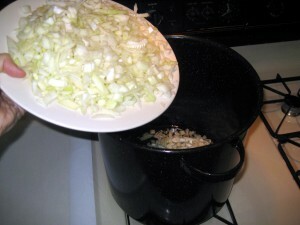 Then add the onions. Fry them until they get golden and glass-like translucent. Add the meat (mäso) and brown it from all sides. You can brown all the meat in the kettle but I figured it will be faster if I do one half (one 3lb packet) separately in a frying pan. If you fry your meat separately like this, make sure to pour in all the juices into the kettle. Add water. I didn’t measure how much I added in, but it was enough to get this 16L stock pot 2/3 full. Roughly speaking, you want half the soup be water and the other half meat. 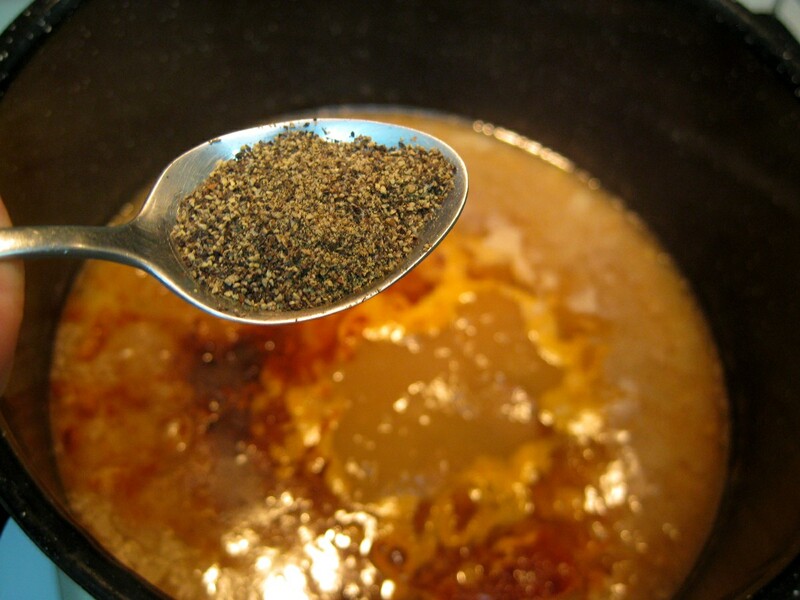 When adding water, it’s better to add in several small batches and wait for the water to come to boil in between each addition. This way the meat will continue to cook. Add the spices: paprika (sladká červená paprika), Cayenne pepper (štiplavá červená paprika), ground black pepper (mleté čierne korenie), and salt (soľ). 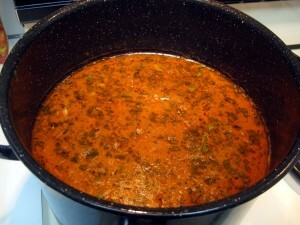 Cover and let simmer on low heat for about an hour. 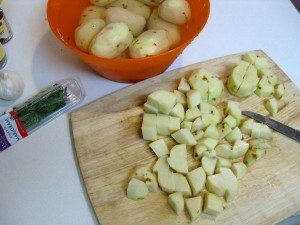 In the meantime, peel and cube all but two potatoes and get minced garlic ready to go. 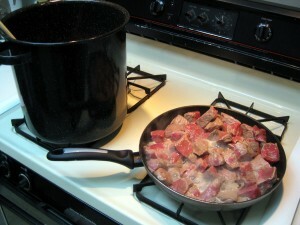 Add the cubed potatoes into the goulash once the meat is almost ready. Also add the marjoram, I used both fresh and dried. 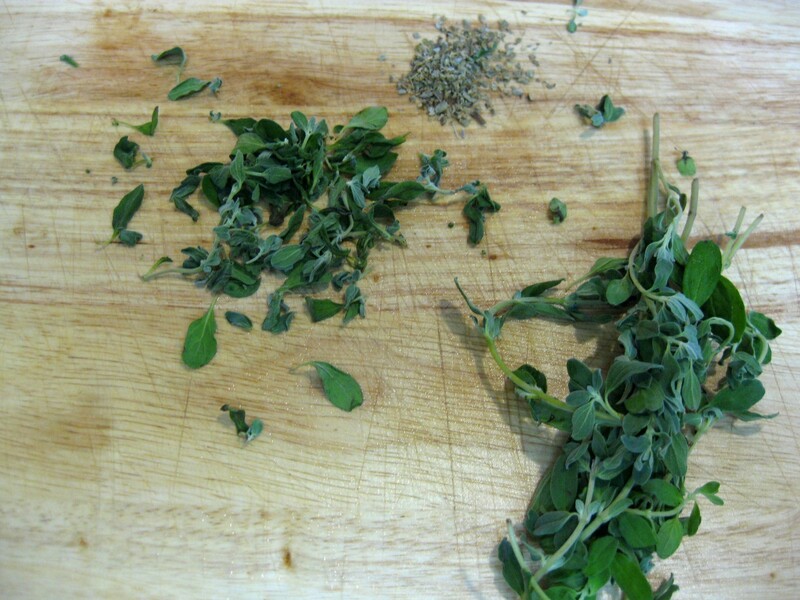 When substituting fresh herbs for dried ones, use one tablespoon of fresh herbs for each one teaspoon of dried herbs. Mince the garlic cloves and add these into the pot. 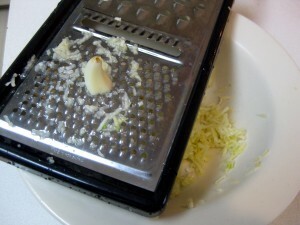 Also grate the remaining two peeled potatoes using a grater. 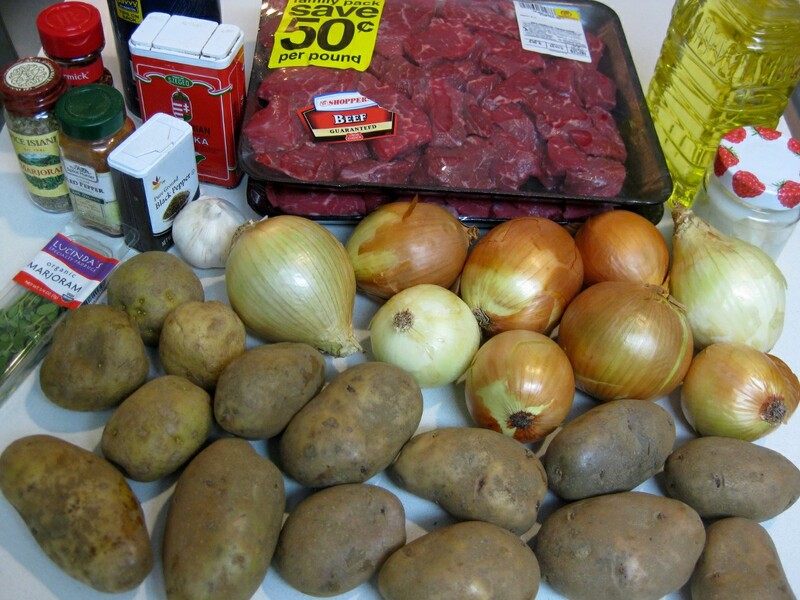 Add these in as well, these potatoes will help thicken the stew. 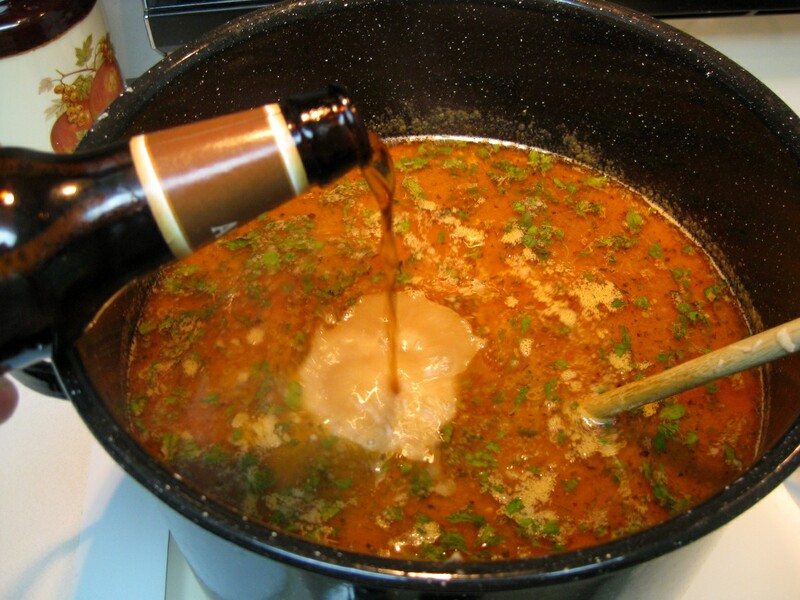 Finally, if the goulash tastes too thick, you can thin it by adding some dark beer. Or just add the beer regardless. I used about 1/3 bottle of “dark amber” brew. And that’s it, look at all that delicious oil floating on top! 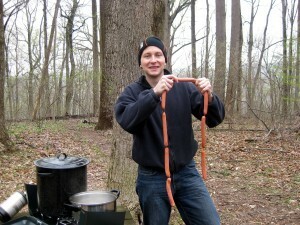 We also had hot dogs (párky). The Giant grocery chain sells “New York deli-style” hot dogs that look and taste very much like Slovak hot dogs. 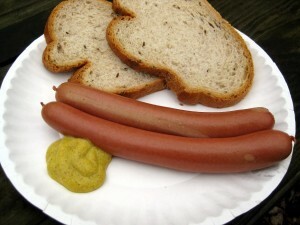 By the way, hot dogs are served differently in Slovakia than here in the US. One way is to serve them in a hollowed out bread roll. These are hollowed out by a heated spike that toasts the roll from the inside. You then squirt mustard into the slot and then put in the párok. This kind of hot dog is called, quite appropriately, párok v rožku (hot dog in a bread roll). 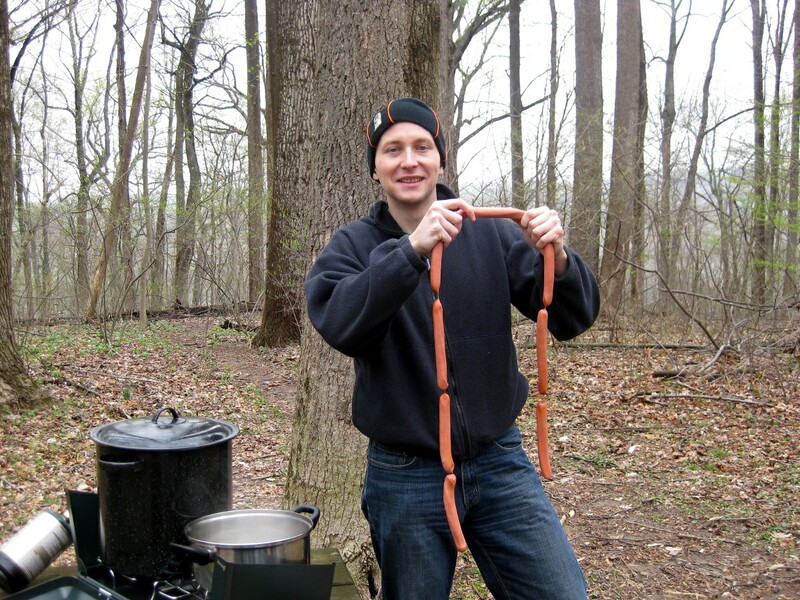 The other way of serving hot dogs is by simply placing two cooked pieces on a paper plate with mustard and few slices of rye or whole wheat bread. This way is popular at festivals where vendors may not have that fancy bread roll toasting spike. This looks like a gorgeous recipe! I can’t wait to try it! Thank you for sharing. Even you made a variation from “classic” though I am not sure if that was ‘classic” recipe as I’ve seen other variation claiming the same. 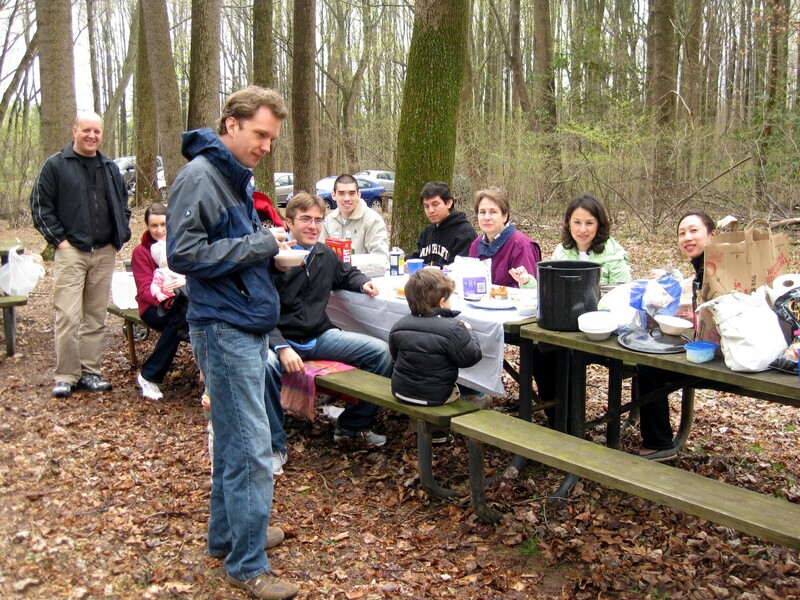 I guess what makes it a “kettle goulash” is that it indeed is usually cooked at outings and picnics and shoots just for basic ingredients (beef, potatoes, onion, and garlic) and some spices. While cooking it at home I always add some veggies (e.g., tomatoes and peppers). I understand that it’s a large pot, though I still think it’s too much oil and not enough salt for this large mount of potatoes and meat. All the recipe which Lubos put is ok its one of a million ways to prepared, i have shared how we do it with my friends on bbq in the uk! Ja Som si do mojho pridal zelene feferonky, zlte a orandzove papriki (doda chut aj farbu), a rajciny. Dakujem pekne za start teraz si len puchutnavam…mmm…mmm…mmmm. bolo by dobre keby si nechal tvoj recept a ktore dalsie dobrotiny patria do kotlikoveho gulasa. Thanks for posting, this too looks delicious!